← Have You Tried: Sunchokes? 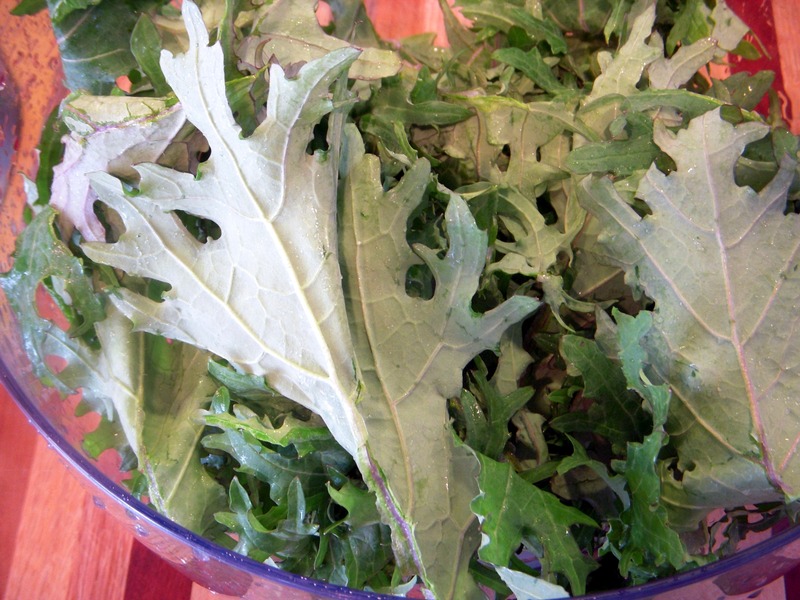 As a part of our winter CSA with Brines Farm, we received some Red Russian Kale in with our lovely assortment of greens. I’m a huge fan of kale, and enjoy it sauteed, roasted, blended into soups – you name it, I’ll eat it! I wanted to try something different this time though, and I thought the Turnip Green Tart Recipe from Heidi Swanson at 101 Cookbooks would be perfect. Heidi’s recipe calls for a cornmeal tart shell, but I already had a basic crust waiting for me in the freezer, so I let that thaw out and was ready to go. If you go with her tart shell recipe, I wholeheartedly agree with the suggestion to make two at a time. Whether tart shells, pie crusts, or pizza dough, make more than you need, pop the extra in the freezer, and save yourself a little bit of effort next time. For the filling, I used my kale instead of turnip greens, and substituted sour cream for the heavy cream. 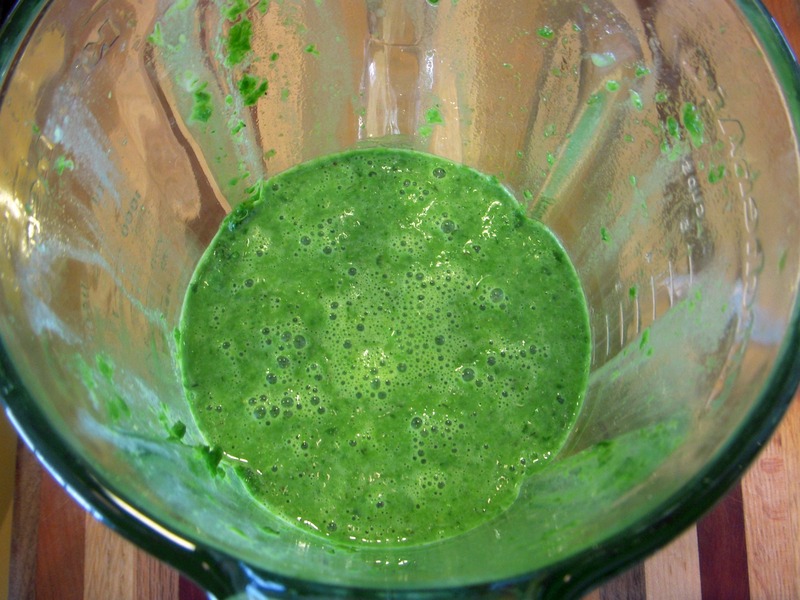 Then I blended up all of the other ingredients (except for the herbs de Provence – only because I forgot to add them) into a very green frothy filling. After about 30 minutes in the oven, my tart was ready, and I was happy that it retained its vibrant hue! The tart was silky smooth (think pumpkin pie texture), and the hint of garlic and mustard were great compliments to the kale. A little something was missing for me though. I think next time I would definitely use the cornmeal tart shell, and add some cheese. Either the gruyere on top that Heidi suggests or perhaps some chunks of feta mixed into the filling after it is blended. Either way, a savory tart is a great way to eat your greens! This entry was posted in In the Kitchen (recipes & more) and tagged brines farm, CSA, farmer's market, kale, lindsay jean hard, Real Time Farms, shannon brines. Bookmark the permalink. This tart looks GREAT! I can’t wait to try it. However, the original recipe says it takes 950 minutes to prepare – yikes – is that accurate? We have both spelt flour and cornmeal from Jennings Bros. Grains purchased at the Ann Arbor Farmers’ Market, so the recipe for the crust looks doable. This is a great-looking dish, especially at a holiday buffet. 🙂 Thanks for sharing it!